Landscape genetics to identify landscape and environmental features that constrain genetic connectivity and thus to account for dispersal and gene flow across the landscape. The candidate is expected to have good training in statistics or mathematical modelling and have a strong background in ecology or evolutionary biology (population genetics and phylogeography). Typical PhD candidates will have a master degree in ecology or evolutionary biology. Basic knowledge and interest in ecology and landscape genetics is required. Experience in molecular genetics and GIS knowledge will be further appreciated. Programming skills in Free and Open Source Software (FOSS) such as in the R and GRASS environments will be a clear advantage. Teamwork skills, curiosity, autonomy at work as well as good oral and written communication skills in English will also be valued. The student will be hosted within the research unit EDYSAN (Ecologie et Dynamique des Systèmes Anthropisés, FRE 3498 CNRS – UPJV, head Prof. Guillaume Decocq), 33 rue Saint Leu, 80000 Amiens, France. EDYSAN is a young, diverse, vibrant and international research community with strong collaborative interdisciplinary ties within and beyond Amiens. Applications (letter, CV and 2 contacts for references) should be sent to Annie Guiller, Jonathan Lenoir and Guillaume Decocq (guillaume.decocq@u-picardie.fr) no later than June 15. The selected candidate will have an audition with the Doctoral Department at UPJV (Université de Picardie Jules Verne, Amiens) in the beginning of July and, if successful, will start in September 2017. According to Robert MacArthur, the realized niche breadth of species is positively associated with latitude (cf. MacArthur’s latitude-niche breadth hypothesis), namely niches in highly diverse tropical regions near the equator are narrower than in less diverse boreal and polar regions (MacArthur, 1972). If you want to know more on this hypothesis, I highly recommend to read the paper from Vázquez & Stevens (2004) who deeply discuss the concept behind this hypothesis and made a thorough meta-analysis of the evidence for or against the latitude-niche breadth hypothesis, concluding that the null hypothesis (i.e, that there is no correlation between latitude and niche width) cannot be rejected. According to Klaus Rohde (see his post on MacArthur’s latitude-niche breadth hypothesis), a priori assumptions of this hypothesis are flawed: “The latitude-niche breadth hypothesis makes equilibrium assumptions, implicitly and explicitly assuming that niche space is more or less saturated with species. However, there is much evidence for an overabundance of vacant niches and that most ecological including tropical systems are far from saturation” (for a discussion and examples see Rohde 2005). In a recent paper published by Safaa Wasof who will soon defend her PhD, we tested the niche conservatism hypothesis among distant populations of the same species and for a fairly large number (n = 888) of native European vascular plant species occurring in both the Alps (central Europe) and Fennoscandia (northern Europe). 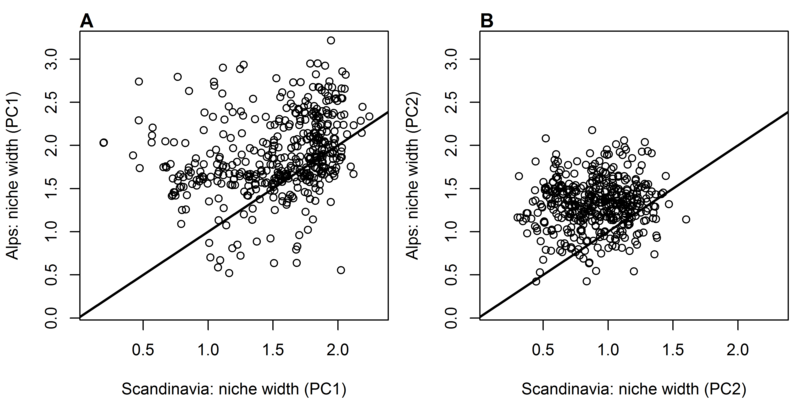 In addition to that, we also compared the realized niche breadth between populations from the Alps and populations from Fennoscandia, assuming that niche breadth would be wider for populations thriving in Fennoscandia than for those thriving in the Alps according to MacArthur’s latitude-niche breadth hypothesis. Well, we found the opposite pattern: populations from central Europe in the Alps have, on average, a wider climatic niche breadth than populations from northern Europe in Fennoscandia, thus contradicting MacArthur’s latitude-niche breadth hypothesis. Although we compared only two regions and did not cover the entire latitudinal gradient from the Tropics to the North Pole, our result is cristal clear. If you want to know more about this result, you are very welcome to read Safaa’s paper (Wasof et al., 2015). However, this result was not the central message of Safaa’s paper which we twisted on the niche conservatism hypothesis and its relevance for species distribution models. Here I would like to focus more specifically on MacArthur’s latitude-niche breadth hypothesis and the result we found. This is also a nice opportunity for me to present a slightly different set of analyses that we ran together with Safaa but which did not get into the manuscript or the appendices (Safaa’s paper is just the tip of the iceberg). So, instead of using growing degree days (GDD) and the aridity index (AI) solely to capture species realized climatic niche, like we did in Safaa’s paper, we here used a larger set of bioclimatic variables (8 out of the 19 bioclimatic variables from WorldClim: BIO2, BIO5, BIO6, BIO7, BIO8, BIO15, BIO18, BIO19) that we subsequently reduced to a bi-dimensionnal climatic space by using a Principal Component Analysis (PCA). We used the 1-km resolution bioclimatic grids that we each clipped to the two study regions (see Figure 1A for an example based on BIO5) before running the PCA (Figure 1B). The resulting first (PC1: Figures 1C and 1D) and second (PC2: Figures 1E and 1F) PCA axes captured 49% and 24%, respectively, of the total inertia. Note that Figures 1C, 1D, 1E and 1F are showing the spatial distribution of the PC1 and PC2 variables of the analog climatic space solely (cf. purple point cloud in Figure 1B). Focusing on the analog climatic space solely to make climatic niches comparable between the two regions (cf. same reference), we used a set of 440 species, out of the 888 species belonging to the common species pool, for which we had enough data to compute the climatic niche breadth across both regions and along both PC1 and PC2 axes. Figure 2 shows an example of the realized climatic niche of Corydalis cava across the PC1-PC2 bi-dimensionnal climatic space for both the Alps (on the right) and Fennoscandia (on the left). Figure 2: Realized climatic niche of Corydalis cava across the PC1-PC2 bi-dimensionnal climatic space for both the Alps (in red) and Fennoscandia (in blue). 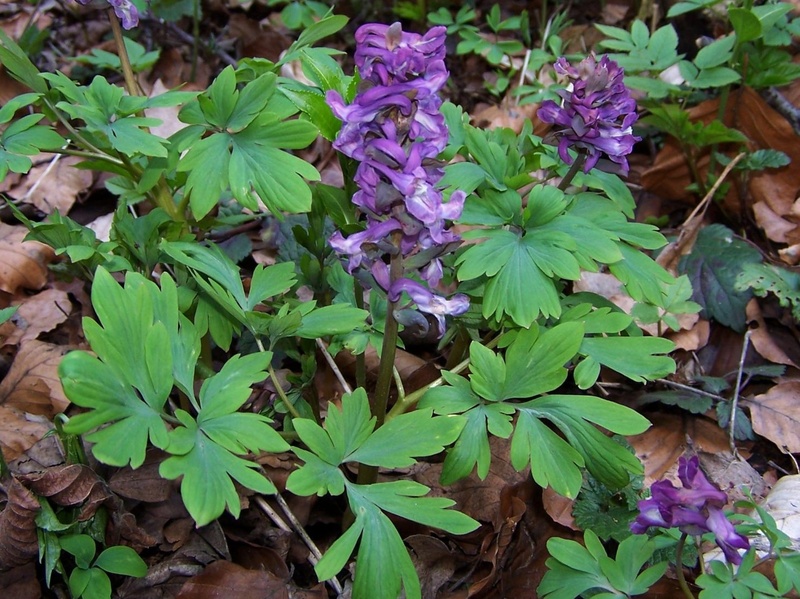 Corydalis cava (Source: Wikimedia Commons). Niche breadth along both PC1 and PC2 was computed as the 95% confidence interval around the optimum value (cf. maximum density position). Figure 3 shows the result for all 440 studied species along PC1 (Figure 3A) and PC2 (Figure 3B). I guess statistical tests are useless here given the strength of the signal. For most European vascular plant species, populations from the Alps have wider realized climatic niche along both PC1 and PC2 than populations from Fennoscandia. This trend towards wider niches in the Alps than in Fennoscandia (Figure 3) invalidates MacArthur’s latitude–niche breadth hypothesis. In Safaa’s paper we discuss several potential drivers behind this result. My favorite one implies greater genetic diversity due to a diversity of refugia close to the Alps (Schönswetter et al., 2005), corresponding to greater habitat heterogeneity, thus increasing the likelihood for a species to widen its fundamental climatic niche in the Alps. Schönswetter et al. (2005) Molecular evidence for glacial refugia of mountain plants in the European Alps. Molecular Ecology, 14: 3547–3555.